"Come on over for dinner, friends! 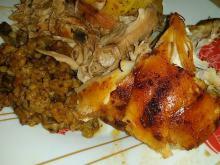 Today we`ve prepared an oven-baked Stuffed Rabbit with Rice." 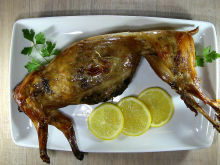 Put the rabbit in a suitable tray, make a marinade from the spices and oil and smear the rabbit on all sides. For the filling, put the rice in a pot with water and boil until semi-cooked. 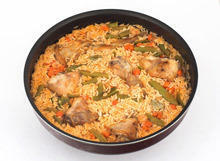 Heat the oil in a suitable pan and braise the finely chopped onions and offal, add the drained rice and season. 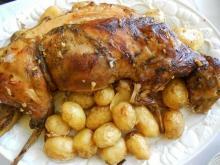 Remove from the stove and fill the rabbit with the prepared stuffing. Tie it with thread or pin with toothpicks, tie the legs together with thread so that it retains its shape during baking.